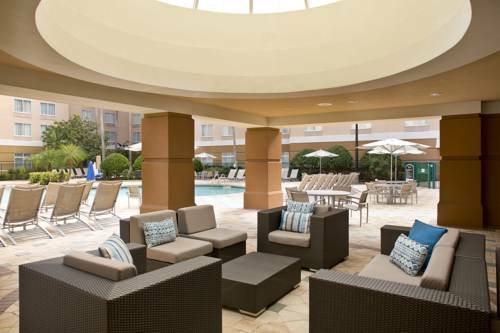 Let the magic of The City Beautiful enhance your stay at SpringHill Suites Orlando Lake Buena Vista in Marriott Village. As a Walt Disney World Good Neighbor hotel, we offer a team well-versed in the nearby theme parks and attractions that draw visitors to Orlando, including Walt Disney World , Universal Studios and SeaWorld . After an exciting day in the sun, return to relaxation in our Lake Buena Vista hotel suites, complete with contemporary furnishings, fun pops of color, free Wi-Fi, luxurious bedding and separate sitting and sleeping areas. During downtime, splash around with the whole family in our resort-style pool, or work up a sweat in the fitness center with cardio equipment and free weights. Stop by our complimentary breakfast buffet for the ideal start to your day, then head to The Marketplace at lunch or dinner to satisfy your cravings for pizza, sandwiches, ice cream and more right on site. Book your upcoming getaway today and start planning your adventures in The Sunshine State!